The War of Jenkins' Ear had been forgotten, subsumed in a far greater conflict now raging: the War of the Austrian Succession. In those days, the Austrian Empire was a vast but vulnerable state, whose territories included not only the modern Austria, Hungary and the Czech lands, but also Milan and Belgium, and it was for control of these territories that Britain supported the Austrians against France, with Frederick the Great of Prussia a maverick, changing sides more than once to suit his own advantage. It can be seen as a world war, with fighting not just in Europe but also between the British and French bases in India and America too. It was as part of this war that Charles Edward Stuart, "Bonnie Prince Charlie", staged his rebellion in Scotlabd in 1745 and marched his little army of Highland clansmen down through manchester and as far as Derby before turning back and suffering defeat at Culloden the next year. Thomas Anson remained at Shugborough throughout, and sent his brother details of the revolt. Like many other contemporaries, he grossly overestimated the size of the rebel forces. Meanwhile George Anson was given command of a fleet of 14 warships in the Channel: his flagship the "Prince George", with 90 guns and a crew of 770. For weeks he kept his ships at sea off Britanny, occupying them by practising manoeuvres while they waited for the French to venture out of the great port of Brest. Eventually in May 1747 De la Jonquiere's fleet did emerge, and Anson scattered them and hunted them down in the Battle of Cape Finisterre; capturing 10,000 troops and immense amouts of money intended for the French wars in the colonies. Anson's reward, apart from his share of the plunder, was to be promoted to full Admiral and given a peerage and a coat of arms. Next year he cemented his alliance with the government by marrying Elizabeth Yorke, the daughter of Lord Chancellor Hardwicke; and when in 1751 Henry Pelham reshuffled his cabinet Anson was appointed First Lord of the Admiralty; the minister responsible for the navy. He modernised the "fighting instructions" to captains, created the first permanent Corps of Marines, devised the first proper naval uniforms and began the process of sheathing ships' bottoms with copper, thus safeguarding the timbers against the ravages of shipworms, a menace in tropical waters. Anson was now a great man, and to befit his status he bought himself a suitably grand house: Moor Park in Hertfordshire (now a golf club and not normally open to the public). He is said to have spent £80,000 improving the estate: an immense sum. But much of his wealth went back to Shugborough in Staffordshire, where his brother Thomas began to rebuild the house, shifting a village of his tenants across the river Trent to make space for a romantic parkland. We can still see at Shugborough the Chinese pavilion, designed by Piercy Brett, a future Admiral who had been with Anson in Canton. Thomas was also elected M.P. for Lichfied in the general election of 1747: naturally he supported the Whig government, which otherwise did badly in Staffordshire. In 1754 Henry Pelham died in office, and his brother the Duke of Newcastle succeeded to the Premiership. It all looked plain sailing for Anson and his Whig friends, but it was not to be. The War of the Austrian Succession had effectively ended in a draw, and many issues had been left unresolved both in Europe and the colonies. A replay of the war looked imminent. Suddenly in 1756 Newcastle's complex diplomatic schemes collapsed in ruins; France, Austria and Russia signed an alliance, leaving Frederick of Prussia as Britain's only friend. Then Britain's navy unexpectedly failed, with Admiral Boscawen unable to prevent the French from sending reinforcements to their bases in North America. But the blow which brought down the government could be linked directlt to Anson. Britain had been granted the island of Minorca back in 1713. In April 1756 the French launched an attack, without any declaration of war. 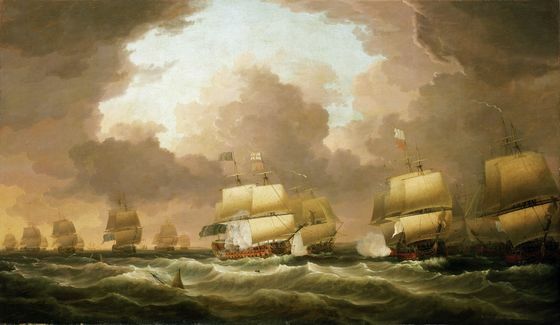 Admiral Byng was sent to relieve the island, but failed to bring the French fleet to battle, and Minorca fell. The unhappy Byng was made a scapegoat for the disaster: on his return home he was courtmartialled and sentenced to death for cowardice and disobeying orders. 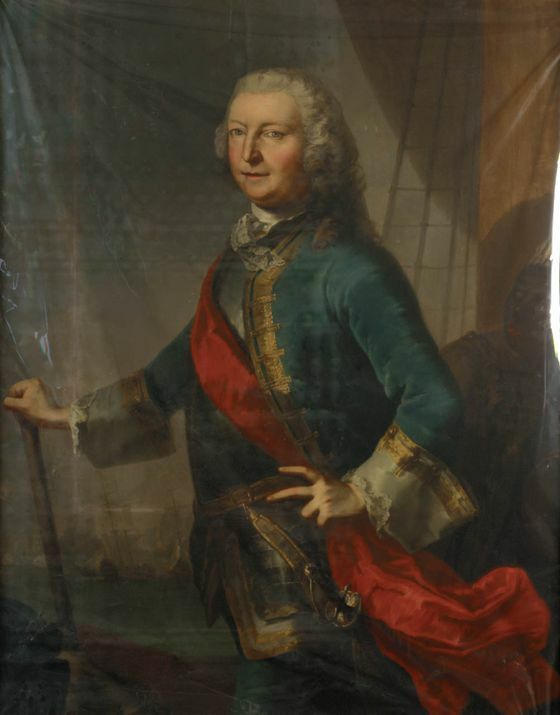 (We should remember that Byng was not only an Admiral; he was also a Member of Parliament and came from a proud naval family: indeed, his father was none other than Sir George Byng, who had commanded the fleet at the battle of Cape Passaro back in 1718, when Anson had his first experience of action) Anson cannot escape his share of the blame for the Minorca fiasco, and was upset by Byng's sentence, but made no effort to save him, and the unhappy Admiral was executed by firing squad on his own quarter-deck in March 1757. By this time Anson was out of office. With Britain humiliated by the French and apparently facing ruin, the popular demand was for William Pitt to take power and save the country. In October 1756 Newcastle resigned and Pitt formed a government; Anson was sacked along with the rest of the ministers and replaced at the Admiralty by Earl Temple, Pitt's brother-in-law. But this arrangement could not last long; Pitt lacked sufficientfollowing in Parliament and the king, George II, did not like him. In April 1757 Pitt was forced out, and for a whole month britain had no effective government at all, until Lord Hardwicke was able to negaotiate the formation of a wartime coalition ministry. Newcastle returned as nominal Prime Minister, but direction of the war was firmly in the hands of Pitt as Secretary of State, and Anson returned to the Admiralty. The navy was central to Pitt's plans. In Europe, British money, raised with loans borrowed through the Bank of England, would pay Frederick and other German princes to fight the French on land, while the superior British fleet would first of all neutralise French sea power and then take out the French bases in Canada, the West Indies and India one by one. 1759 was the turning point of the war. The final result was still in doubt, and Choiseul the French Prime Minister pinned his hopes on an invasion of England. A large flotilla of barges was assembled in the French Channel ports, by which an army of at least 50,000 would be convoyed across by the french navy. It should be remembered that at this time the population of France was at least four times that of Britain, and her army very much larger; and that under Pitt's grand strategy two thirds of the navy and almost all the regular troops were fighting overseas: Britain lacked modern coastal fortifications and was defended only by the part-time soldiers of the militia. Choiseul could hardly have expected an invasion would lead to the seizure of London, but a more rea;istic and equally useful result could be that a successful landing would cause a run on the Bank and a collapse of Britain's financial structure. At the very least, the mere threat of an invasion might force an abandonment of Pitt's colonial strategy and the withdrawal of forces to defend the homeland. Lord Lyytleton wrote, "We talk of nothing here but the french invasion; they are certainly making such preparations as have never been made to invade this island since the Spanish Armada, but I trust in God and Lord Anson". Lyttleton's trust was justified. Pitt and Anson kept their nerve and refused o modify their plans. French success would depend upon the two fighting fleets,at Brest in Britanny and Toulon in the Mediterranean, somehow uniting and seizing control of the channel. Anson created a "Western Squadron" to protect home waters and blockade French ports, but in the days of sail no blockade could ever be total. Bad weather, or the need for restocking with fresh water and food, would force a withdrawal and provide the French with an opportunity to break out. As it happened, 1759 became the great "Year of Victories" for Britain.In summer of that year, the French Toulon fleet managed to sneak past the blockade and out of the Mediterranean, but Boscawen caught them off Lagos, on the coast of Portugal. In November, ferocious storms forced Hawke’s fleet, which was keeping a watch on the great harbour of Brest, in Brittany, to take refuge back in Torbay. The French admiral, Conflans, rashly assumed the coast was clear for the rest of winter, and set out, but Hawke pursued him and destroyed his fleet in a savagely-fought battle at Quiberon Bay. Meanwhile Rodney had attacked and smashed the French barges at Le Havre. The colonial struggle remained unaffected. Already in India, Robert Clive had gained control of Bengal. In Canada, Saunders sailed his ships up the St. Laurence to take part in Wolfe’s capture of Quebec; the French West Indian islands, such as Martinique and Guardaloupe, fell one by one; and when Spain belatedly entered the war on the French side, British expeditions took Manila in the Philippines and Havanna in Cuba in the summer and autumn of 1762. It was as comprehensive a victory as could have been imagined, and the superiority of the British navy was the chief contributor. It was to honour the navy that the famous actor and impressario David Garrick (another Staffordshire man!) celebrated the year of victories by writing the great patriotic ballad, “Hearts of Oak”. Anson’s contribution, apart from planning these expeditions, was to organise an enormous expansion of the navy, now up to 70,000 men (from a population barely one tenth of what it is today), with many new warships being built: most famously HMS “Victory“, whose keel was laid in 1759, but the ship not launched until after the war had finished. All this, naturally, proved extremely expensive; the National Debt increased 50% to pay for the war, and the country was faced with interest payable on the debt absorbing 33% of all taxation revenue. Anson did not live to see the seizure of the Spanish bases, or the final end of the war in 1763. In 1760 King George II died and was succeeded by his young grandson, George III. The new king chose as his bride Princess Charlotte of Mecklenburg-Strelitz in Germany, and Anson was given the honour of escorting her to England, in a ship specially renamed the “Royal Charlotte” in August 1761. But next year he caught a cold, never recovered his health, and died that June at Moor Park. He is commemorated locally only by a simple plaque in Colwich church. Anson had no children, his wife having predeceased him in 1760, and so his property devolved on his brother Thomas, who used it for further elaborations at Shugborough. Amongst other things, he erected a replica of the Arch of Hadrian from Athens as a monument to his brother, containing effigies of the admiral and his wife. But Thomas never married, and when he died it all passed to the brothers’ nephew, the son of their sister Jeanette. This man, George Adams, changed his name to Anson, and inherited not only the property but also the parliamentary seat at Lichfield; and the Anson peerage was later revived for his son. But the true founder of the family’s fortunes was their greatest member, Admiral George Anson. Not everyone liked Anson. Dr Johnson always belittled his achievements; for although Johnson was a Lichfield man, he was also a diehard Tory and a Jacobite sympathiser and despised all Whigs. Horace Walpole thought Anson reserved and proud, and recorded a wisecrack that “He was so ignorant of the world that though he had been round it, he had never been in it”. But William Pitt, who was best placed to know Anson’s qualities in government, said, “To his wisdom, to his experience and care, the nation owes the glorious success of the war”.